Move your mouse or finger over the image to zoom in. 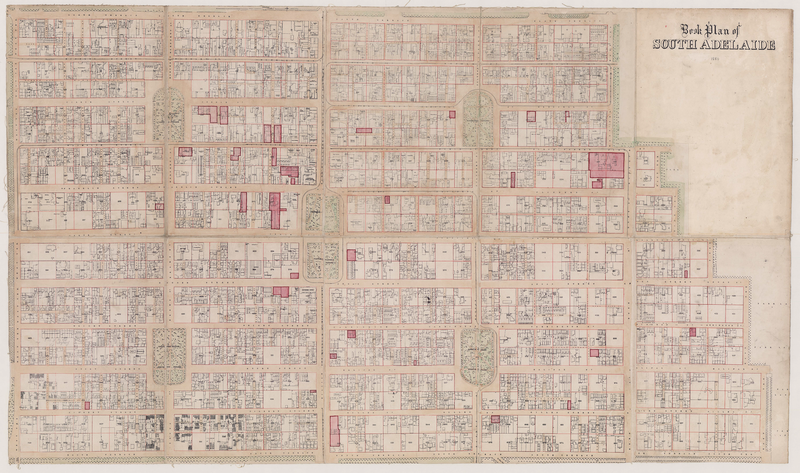 The Book Plan of South Adelaide was produced from a survey of the City of Adelaide conducted in 1880 by City Engineer and licensed surveyor, Charles W Smith. The survey was undertaken in preparation for the installation of the city’s first comprehensive sewage removal and treatment system. Most houses at this time only had cess pits, which were baled out periodically by night carters. The few buildings with water closets drained into soakage areas in the parklands. The lack of proper sanitation, together with a lack of clean water and effective rubbish removal and destruction, made Adelaide a very unhealthy place in which to live. In the 1870s Adelaide’s death rate was nearly double that of rural areas. Smith’s survey plotted even the smallest buildings in the city. The Book Plan shows row cottages with their outhouses and backyard washing areas, as well as mansions, businesses, places of worship, and government buildings. Some premises are named. It also shows street names and town acre numbers. Once the survey and construction were complete, Adelaide became the first city in Australia with a separate water-borne sewerage system. Book Plan of South Adelaide, (Adelaide: Surveyor General’s Office, 1880).Venus, Richard, Engineering a City, (Adelaide: Engineer’s Australia SA Division, 2009). Jude Elton, History Trust of South Australia, ‘Book Plan of South Adelaide’, Adelaidia, History Trust of South Australia, http://adelaidia.sa.gov.au/panoramas/book-plan-of-south-adelaide, accessed 19 April 2019.